US President Trump has reportedly demanded that Israeli Prime Minister Benjamin Netanyahu cut ties with China, and is threatening to cut security cooperation with Tel Aviv. According to Axios report, the demand was made on March 26, minutes after Trump recognised the disputed Golan Heights as part of Israel. Sputnik discussed Israel's pivot and the US-China economic conflict with Alexander Azadgan, a professor of international political economy, senior geopolitical analyst and editor-at-large with Imperia News. Sputnik: "If you don't limit the Chinese penetration into Israel, security cooperation with the US will be harmed," Trump said. What's your take on this statement? 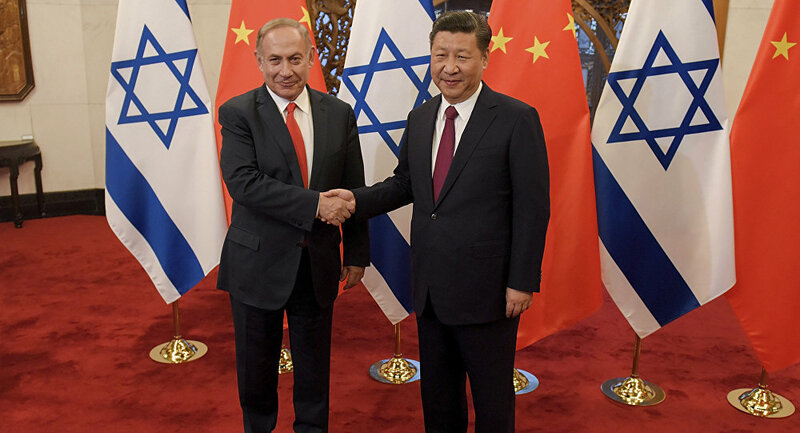 How could it possibly influence cooperation between China and Israel? Professor Alexander Azadgan: By now, I think everyone has seen Mr. Trump’s tactics and arm twisting and mafia diplomacy; and if you really wants to understand this man’s psyche, you have to live in New York for a couple years to understand this type of real estate hustlers, especially back street hustlers and the methods of land developers and what-have-you. He's using the same business tactics, applied to geopolitics, and of course this is not going to fly. The Israelis always have their own national interests at heart, no matter how much they’ve tried to fight all their wars using American soldiers. I think after the recognition of Jerusalem as Israel’s capital, followed by the recognition of the Golan Heights as being part of Israel and basically the victory that President Trump provided to Mr. Netanyahu, in spite of all his financial improprieties and indictment and what have you, there’s a price attached to it. By now, I think everyone has seen Mr. Trump’s tactics and arm twisting and mafia diplomacy; and if you really wants to understand this man’s psyche, you have to live in New York for a couple years to understand this type of real estate hustlers, especially back street hustlers and the methods of land developers and what-have-you. He's using the same business tactics, applied to geopolitics, and of course this is not going to fly. The Israelis always have their own national interests at heart, no matter how much they’ve tried to fight all their wars using American soldiers. I think after the recognition of Jerusalem as Israel’s capital, followed by the recognition of the Golan Heights as being part of Israel and basically the victory that President Trump provided to Mr. Netanyahu, in spite of all his financial improprieties and indictment and what have you, there’s a price attached to it. I don’t think the Israelis, no matter how close they are to the West, especially France and the United States, are going to fight what’s happening, what’s going to be the future that's manifesting itself. That is: the concentration of power is going to be in the East, and by the East, I’m referring to Russia and China and India. This trend is unavoidable, you cannot fight against it. And yes, it is true that the US Navy's Sixth Fleet has been in the Port of Haifa for many decades now, but that’s just a military arrangement. I think Israel is going to try to play both sides of the fence, that’s what they usually do – if you've studied their history – before they even formulated into a country in 1947-1948. And I think these arm-twisting tactics that Mr. Trump and the neo-cons have been practicing literally since 2003, since President Bush actually went on air at the joint State of the Union in front of our Congress and said “either you are with us, or you are against us.” This mentality is over because we have lost in Iraq, we have lost in Afghanistan, we are actually going to actually negotiate with these savages, the Taliban; we have lost in Syria and in spite of all the people that our weapons have murdered in Yemen, we are going to lose in Yemen as well. So, telling countries, dictating to countries, even a Jewish country like Israel, telling them what to do or that there are going to be consequences, which is what Mr. Trump is pointing out to. Or telling Turkey 'you cannot buy S-400 missiles from Russia', or telling India they cannot do the same… In a few years, this is going to be a joke in the history books. These are all signs of a decaying empire, and I hate to say this about my own country. It gives me no pleasure to say this. These are all signs of a decaying empire who is resorting to these types of tactics. I think of Socrates, who said over 2,500 years ago that if you lose your power of persuasion and you are solely relying on your muscle power and your power of coercion, you are no longer a power, whatsoever. And I think this is the sad thing that is happening in the United States. And I think the Israelis are going to delay this, they are going to try to create an image of negotiation, they are going to try to make the Chinese happy, they are going to try to make the US happy; but we are talking about a multi-billion-dollar deal and the Chinese are literally everywhere. They are all across the Middle East, they are literally all over Africa; they are buying infrastructure and engaging in multi-billion-dollar contracts. And we’ll have to wait and see what happens in the case of Israel. It’s very interesting that you mention it, because there are vast amounts of natural gas that have been discovered in the Eastern Mediterranean, that’s found in the territorial waters of Lebanon and Israel; and part of the Syrian conflict was always to distract the Syrians from getting their share of that natural gas. And Israel has been developing that, and Israel is going to be one of the largest exporters of natural gas, primarily [to] the European market, and they are building the pipes that are going to go underneath the Mediterranean, it’s going to be a great project. One of these fields is called Leviathan, an interesting name. So, while the rest of the Middle East is fighting and bickering among themselves, the Israelis are milking it when it comes to natural gas; and if there’s going to be any contract with the Chinese regarding natural gas exports and if the Chinese actually manage to defeat other bids from other countries, the Israelis are going to go with them. So, I think these games that Mr. Trump is playing are not going to have customers in the near future. Sputnik: But can we assume that this move, moving the US embassy to Jerusalem and declaring the disputed Golan Heights as part of Israel, can we assume this move as pressure on Israel to move away from closer cooperation with China? Alexander Azadgan: Absolutely. Of course it is; but I don’t think the Israelis are naïve to think, to put all the eggs in one basket, as we say. They are going to hedge their losses, they are of course going to invest and have very lucrative deals with the United States, but they also know the storm that is on its way. 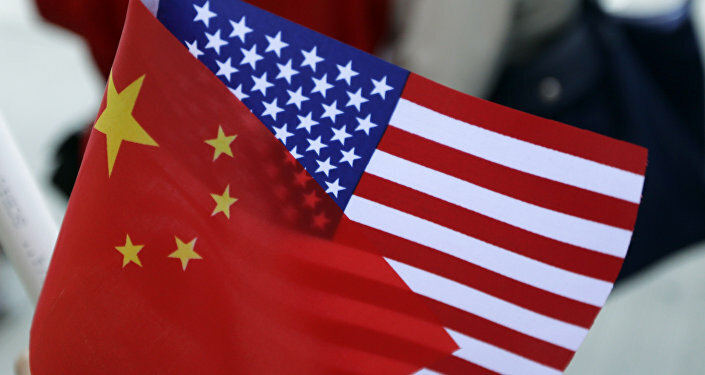 China is going to be a long-term strategic economic adversary for the United States. It’s not because of Mr. Trump; Mr. Trump is just riding that populist wave, but that populist wave is alive and well in America I can guarantee you, and it’s going to continue in the decades to come. And of course when you have an economic adversary in the future – for the time being our economies are very intertwined with China, but our GDP being 18.57 trillion dollars a year and with the Chinese GDP over 11 trillion dollars and catching up, you’re going to feel the heat from the Chinese. Everybody around the world knows that. Even the Saudis who are literally the client state for the United States; you saw how the Saudi King and his little despot prince-son MBS came to Russia and they were trying to close armament deals and weapons deals with Russia, because even they know that you diversify, so the Israelis will do the thing, they will diversify with everybody. Sputnik: You've said that Chinese are huge in Israel's economy. Can you elaborate more on that? How valuable are their investments in Israel? Alexander Azadgan: I think the Chinese would not invest anywhere if it wasn't extremely valuable to them. I think they think long-term, they think very strategically and wherever there is a failure of American political and/or economic leadership, the Chinese will move right in from an economic perspective. From a military perspective, it’s the Russians that are doing that, and we've seen how that has manifested in Syria […] I don't know if you've followed the news with Huawei, major issues with getting some of their highest echelon of corporate leadership arrested in Canada and elsewhere, and [the US is] tying that with Iran. We are looking at a technological revolution with the 5G and so there’s competition; we’re looking at the next generation of telecommunications in the world. Probably we have never accessed anything like this in human history unless you believe in the civilisation of Atlantis. The Israelis are huge on technology, they are huge on counter-surveillance, anything technology-related they are big, they are pioneers, believe it or not; they have one of the most cyber armies, and this 5G transition is a big part of China’s investment in Israel and vice versa. For a tiny little country of around 10 million they're very ambitious and making everybody bid for them, and it really comes to various investments they are going to have. The Chinese are not going to back down; as a matter of fact, this may be used as leverage in the China-US trade war. Sputnik: In your opinion, where it can lead in future trade talks between the US and China? Alexander Azadgan: These two countries desperately need each other. The 325-million consumer population of the United States seems to not [be able to] get enough of Chinese junk products, cheap products. This is not going to stay forever; the Chinese are moving into very specialised products and services. This is going to be a problem that we’re going to have to deal with, whether Mr. Trump is in office or we have a Democrat in office. It’s a difficult situation; both countries need each other; the Chinese have invested heavily in our debt, they are one of the backers of the US dollar. So, it’s almost like these two countries are shooting themselves in the foot if they keep accentuating these trade wars. Mr. Trump, with all his arrogance and hubris about how he thinks he knows the business world works, doesn’t have a clue about the intricacies of international trade, and we are seeing that. But as I said in my other answer, these are issues that are structural, are fundamental, and I think many countries are going to be used as leverage in this trade war between China and the United States. India comes to mind, the Philippines. We all saw how President Duterte expressed [he was moving] towards the United States in trying to combat the Chinese, [who are] trying to take over a lot of these islands in the South China Sea. Iran is one of the bargaining chips. So, I have to say a lot of these smaller countries are going to be leverage for these two super powers to work things out. A lot of promises globalisation made have not manifested, especially for the middle class and lower classes across the world. So, there’s a huge backlash against China, and this is really what this is all about, the US is riding that wave, Mr. Trump is a spokesman of that, and hopefully in the next year and a half, he won’t be President here. But I think this wave of populism is going to continue, because globalisation definitely did not keep its promises and a lot of people are hurting and suffering and losing their jobs. Billions in capital has moved from the United States into China, so this is going to continue. We are just at the threshold of it, I'm sad to say. You add the complexities of geopolitics in the region and you have yourself this very difficult situation to get out of. Sputnik: US Secretary of State Mike Pompeo recently said that China’s financing of President Nicolas Maduro’s government is prolonging the crisis in Venezuela. What's your take on that? Alexander Azadgan: I think it’s very hypocritical to blame other countries. When you go back to 1823 and the Monroe Doctrine of President James Monroe, who basically said the entire Western Hemisphere should be our sea of influence; I think it’s extremely arrogant. We are not going back to those imperialistic or colonialistic days. Yes, they will throw their IMF mafia at Venezuela or other country they want to, it's either the 'lead' or the 'silver' method. But for us to blame the Chinese, or the Russians, or the Iranians [and say] that they are destabilising South America is extremely hypocritical. They've been destabilising South America since Mr. Chavez, a populist like Mr. Chavez who governed the country, and for the first three years people were happy. But we have cornered Venezuela to exactly where we want it to be; it’s not just parable economic miscalculations by the Venezuelan government, we have cornered them into the position that they are at right now. But I rule out an invasion of Venezuela; a lot of this is psychological warfare and media spinning. I think the Chinese are going to escalate their commitments; the Chinese need the Venezuelan oil, Venezuelan oil is the largest reserve in the world although part of the trouble is it's very thick, so it needs a lot of refining, but I think Venezuela made a strategic decision not to be one of the top three exporters of oil to the United States [which gets its] from Canada, Mexico and Venezuela. They made this strategic decision a few years ago, and from that moment it was war; it was economic war between two countries. The Venezuelans want to sell their oil to the Chinese and Indians because they cannot get enough of it, because their economies are exponentially expanding. So, Venezuela is going to be another point of leverage between China and the United States when it comes to trade talks. And from what I know as a student of history, superpowers always sacrifice smaller countries when it comes to their national interests. So, let's hope Venezuela doesn’t get sacrificed between Russia and China, let’s hope that the next cadre of leadership that we’re going to get in Washington has to realise that we’re living in a multipolar world; we are no longer living in a post-1991, post-USSR unipolar world order; that's done it’s finished, it’s over. Russia is reviving, China is coming out, they're waking up from a thousand years of not playing a crucial economic role in the world; and I think the next administration, hopefully it won’t be the Trump administration, are going to realise that they have to negotiate, that they are going to somehow win the Venezuelans back if they want their part of the oil, otherwise they will sell the oil to the next biggest customer and that is China. So all the roots, all the mechanisms are there, it’s just this battle of arrogance with this last gasp of air of neo-colonialism that’s just got to go. The world order that, for example, the BRICS countries are trying to create, is one of cooperation rather than coercion. Our coercive techniques and methods are only going to unite all other countries against us, even some of these European countries who have been traditional allies and even client states for the United States. It’s going to antagonise them, and if we want to pick a trade war with everybody, with the Chinese, with the European Union, then it’s going to have adverse hyper-inflationary results. And our economy is very sensitive and cannot afford to go into that area. Trump's Cancellation of Additional China Tariffs Just a Delaying Move - Prof.